Logic Pro X's Track Stacks are a profound improvement over previous versions' Folders, enabling convenient grouping of related tracks for 'collapsing' and grouped muting/soloing, and even submixing of multiple tracks, complete with effects processing and subsequent bussing. In this walkthrough, we'll show you how to use the Summing Track Stack type to tidy up a project and simplify the mixing process. 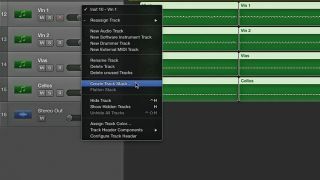 Discover more pro techniques for Logic and other DAWs in Future Music's full Producer Power Tips feature. Step 1: We're starting with quite a fully-formed production. The track features several instrument types - multiple tracks of drums, strings, basses, atmospheres/pads etc - but as each track has been added intuitively, none of these instruments are grouped together or organised. Step 2: We can start to organise the mix by dragging tracks up and down, to place similar instruments next to each other. Accordingly, all drums move to the top, followed by basses, then atmospheres, then strings. As a production grows to many more tracks, this certainly helps when you need to locate a part quickly. Step 3: There are huge advantages to grouping sounds into channel strips, where they can be treated together. We can do this by creating a Track Stack for each group of sounds. Select all the tracks you want to put into a Stack, then right-click and select Create Track Stack. Step 4: There are two types of Track Stack available - we want a Summing Stack. This routes all sounds in that stack to the same auxiliary. We've renamed our Stack 'Strings'. From this, we can now add new auxiliary reverbs which will affect all tracks within the Stack. Step 5: We can then create similar Stacks for the other parts - Drums, Basses and Atmospheres. You don't have to include all tracks within the Stack, though. We don't want our hi-hat to be part of the Drum Stack, so that track stays 'outside'. We add a Bus Compressor to the Drum Stack. Step 6: Just because sounds are organised into Stacks doesn't mean that they can't still benefit from single track treatments too. The 'Rim(shot)' track within the Drum Stack sounds too dry, so we open the stack, find the Rim track and set up a new auxiliary with a 1/8D delay.